Passive preamps do have something going for them – the short signal paths and lack of circuit complexity make for a clean, detailed sound. However, they’re not a miracle cure for the problem controlling your source. Traditionally, they have relied on resistive networks selected with a switch or rotary variable resistors, which can cause substantial impedance mismatches at either the source or the load end, making for a perceived loss of dynamics. So what can the silver box before you bring to the party? Well, MF Audio’s Passive Magnetic Preamplifier overcomes these problems by using a custom made transformer, claimed to feature the largest commercially available 80% nickel Permalloy core, making it passive with gain. So if you have a low gain power amplifier, you can flick the switch around the back to get an additional 6dB of grunt, thus driving it to its maximum efficiency. This is achieved by the use of a volume control featuring two attenuating transformers and ELMA switches point-to-point hand wired into a custom case. Indeed, for a so-called ‘passive preamp’, it has a lot of features. There’s a choice option of balanced or unbalanced inputs and outputs, and all internal connections use 0.6mm silver coated solid core copper wire with PTFE insulation, point to point hand wired. Top quality Neutrik and Deltron connectors and Swiss made ELMA silver contact rotary switches are used. A three way grounding switch allows any grounding issues to be addressed easily, and the transformer isolates components, breaking ground loop problems and reducing noise. The Mumetal shielding can gives protection from external magnetic fields. The three-way rear mounted grounding switch offers a choice between a floating output ground, or the RCA phono or XLRs connecting to the internal ground reference (and to input ground). Construction quality is good, although not in the sumptuous mould of Japanese high end, for example. Six inputs (four unbalanced, two balanced) are provided, numbered and selected from the corresponding front panel knob. The twenty-position volume and six-position source switches move reasonably cleanly (although the review sample had a little noise when clicking between inputs), and the rear mounted connectors are good stuff. Before listening in earnest, I burned the MF Audio preamp in for the recommended one hundred hour period, with a CD player on repeat, my Pioneer SPEC2 power amp off and the MF volume control set to maximum. Preamp references included Pioneer’s matching SPEC1 discrete transistor design and a World Audio KLPP1 valve preamplifier. I have to say that this device impressed me in a way that few passive preamplifiers have. It has an extremely self-effacing nature that means that, when you switch to it from your traditional active solid-state or valve preamp, it throws your previous machine’s character into sharp relief. In my system, after using Pioneer’s ultra-high end SPEC1 for several weeks, I found the MF Audio quite dull through Perigee’s superb FK-1L loudspeakers. However, careful listening revealed that it was more of a case of losing the Pioneer’s chrome-plated edge, which I had rather got used to. Via vinyl, using Trichord’s latest Delphini phonostage to drive one of the MF’s unbalanced inputs, itself fed from my Michell Orbe/Origin Live Illustrious/Dynavector DV20X-H, the true character of the cartridge shone through in a way the Pioneer pre had not permitted. 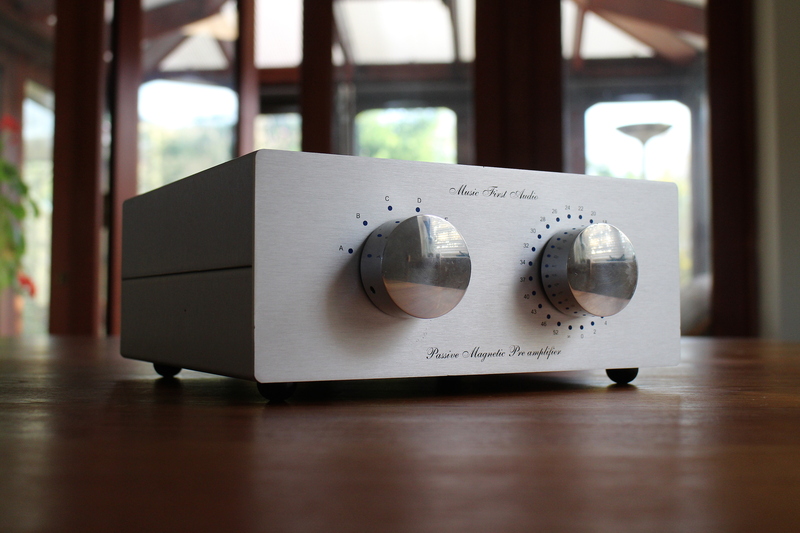 This high output MC is very warm and rich – rather akin to a 1970s Supex SD900 – and this preamp underlined the fact. Via the Pioneer, it had seemed bright and breezy, somewhat akin to an Audio Technica! Admittedly, the extra zest the SPEC1 imparted made for a lively and enjoyable listen, but it wasn’t an accurate one. The MF did the same with CD, too. It isn’t dull sounding so much as very ‘neutral’, resolutely refusing to add anything in the way of zing (which you get from solid-state) or bloom (courtesy of valves). The result can initially feel a tad characterless, but it does allow you to settle in and hear through to your source, rather than have it all dictated by your preamplifer. Nick Drake’s Pink Moon via Meridian MCD Pro made for a very smooth and silky listen, mainly thanks to the choice of CD spinner. So I moved to Sony’s CDP-X77ES and suddenly things got altogether tighter and more incisive – almost excessively so – showing just how transparent this thing can be. De la Soul’s A Roller-skating Jam Named Saturdays, via vinyl, proved this machine’s mettle. The lack of grain and edge meant I could crank up the volume very high and give the Perigees a real workout. This 45RPM twelve incher has some serious bass notes and firecracker dynamics, which shone through with the MF. One recurring sample, of Frankie Valley’s Grease, sounded shrill and digital, but then the lead female vocal kicked in, sounding exquisitely smooth, rich and fulsome. This demonstrated that this pre is transparency personified, and when coupled to like-minded ancillaries can muster a tremendously varied tonal palette. Factor in brilliantly tight and punchy breakbeats and silky percussion sounds, and it was a damn fine listen. Ultimately, Music First Audio’s Passive Magnetic Preamplifier sounds neither as dull as other passive preamps I’ve heard, not as tonally constrained. You may miss the lack of transistor fizz or tube colouration that you’re used to living with, but then again you’re bound to enjoy the superb transparency. Warm brass instruments sound warm, hard and wiry strings sound hard and wiry. Voices are deliciously clean and unsullied, and percussion fast and tight but with no artificial added edge. Another great strength is its soundstaging – you get a wide and capacious recorded acoustic that falls back behind the speakers surprisingly far. Within this, instruments are located precisely and accurately in space. This product is about transparency, neutrality and – if the truth be told – just the very smallest amount of euphonic silkiness. With its tremendously open yet finessed sound, it’s a veritable high end audiophile bargain.